As we have noted, the readings for many Easter liturgies bring us the meditations of John's gospel upon what the life of the Word made flesh means to the world. Sayings of Jesus beginning with ‘I AM’ abound in this gospel – clearly intimating the Saviour's claim to the divine name itself (cf. Exodus 3:14). They come readily to mind: ‘I AM the bread of life’ (6:35); ‘I AM the gate’ (10:9); ‘I AM in the Father’ (10:38); ‘I AM the way; I AM truth and life. No one can come to the Father except through me’ (14:6); ‘I AM the true vine’ (15:1); ‘I want those you have given me to be with me where I AM’ (17:24); ‘I AM he … I have told you that I AM HE’ (18:5, 8); and the momentous, ‘Before Abraham ever was, I AM’ (8:58). 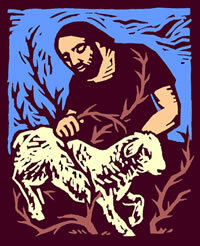 The gospel reading of today's liturgy, ‘I AM the good shepherd’, heard against this background, takes us deep into the mystery of what God has done for us in Jesus Christ – and, as we shall see, it tells us of how God's initiative in the Paschal Mystery was conceived in the depths of the Trinitarian Life itself. The Good Shepherd theme has had a great impact on Christian consciousness. One of the earliest and most repeated motifs of Christian art is the youthful shepherd carrying the lost sheep home on his shoulders. The image it suggests is so telling that it has featured prominently in the Church's preaching in every age. As so often happens with the best things in life, we tend to take this theme for granted. Today's text helps us to find a fresh appreciation of its implications. In it Jesus explains these implications by reference to the Paschal Mystery. He says that he is the ‘good’ shepherd – in contrast to the unfaithful shepherds who have failed God's people, thinking only of their own interests - because, as he three times repeats, he ‘lays down his life’ for them. He lays it down, he explains, ‘in order to take it up again’. In his Resurrection, he will be a source of life for them. And in this drama of his death and resurrection, he is carrying out and making clear to the human family what his Father wills for them – an enterprise so dear to the Father that he looks upon the Son's obedience with a renewed love. It is a plan that works to bring all those who believe into unity. There are other ‘folds’, or pens, than the one the community that gave us John's gospel finds itself in. Through his Paschal Mystery, the Good Shepherd will lead them in the forming of a single ‘flock’, overcoming all the apparently insurmountable barriers that divide the human family. The other readings illustrate the blessings that belong to those who ‘know’ the Good Shepherd and ‘listen to his voice’. We recall the faith and courage of Peter, as he works the Christian Church's first miracle in the power of the divine name – ‘in the name of Jesus’. And we are told that we can become ‘God's children’, through ‘the love that the Father lavishes on us’, with a future which when it is fully revealed will give us a share in the intimate life of God.